The days of large companies dominating food innovation are over. Meeting consumers’ quickly changing culinary needs requires the nimbleness of a small company. Whether it’s a special dietary preference, trendy ingredient or flavor, appreciation for artisanal creation, sourcing preferences, or even a traditional family recipe, new ideas are coming from startups, which can test a concept more rapidly than a large company. In response, large food companies are embracing acquisition as an innovation strategy—more good news for the entrepreneur aspiring for a big payoff. However, the small size that enables a startup to move quickly can also be its Achilles’ heel when it comes to scaling up. Large companies have entire departments devoted to food scale-up that include food scientists, regulatory experts, process engineers, chemical engineers, and recipe formulators. Today, many home chefs and college students with a product idea or family recipe are the entrepreneurs who need to scale-up to a larger production. The operational complexities of scale-up can be a surprise and lead to unnecessary costs and delays. Resources are available for small startups who need the temporary help of experts. Learning from others and planning ahead can help them avoid common pitfalls of scale-up. With that in mind, we offer 12 lessons for a successful scale-up. 1. DO adjust your formula for the larger scale. Ingredients may not behave in the same way, so they may need to be adjusted or changed to achieve the desired result. An ingredient may be too expensive to meet your price target. An ingredient’s stability may not meet the needs of your new process. The finished product may have a different taste or texture. Units of measurement may go from teaspoons and cups to pounds and gallons. The length of baking or cooking time may change. 2. DON’T assume your sourcing strategy will stay the same. You may need to rewrite a formula to hit your price point. If using specialty ingredients, you may have difficulty sourcing them in larger quantities. Your existing supplier may not be able to source larger quantities. Delivery and storage may be impacted. Documentation and quality assurance procedures could be impacted. Ingredient costs generally don’t have as significant of an impact on profit margins at a small scale. When scaling up, however, a costly ingredient could be a bigger hit to your bottom line. You may need reevaluate whom you’re buying from, or your formula may need to be rewritten to meet your target cost of goods sold. 3. DO consider changing your ingredient delivery methodology. Do you need to add product process lines and pumping equipment? It may no longer be efficient or safe to move products in large tubs or intermediate bulk containers. If adding pumps and piping, do you understand the types and sizes of pumps needed and the safety concerns of the piping design, pressures, temperatures and low-point drains? Can ingredients still be manually dumped, or are their characteristics such that they need to be loaded into totes or pneumatically conveyed from a bulk storage area? Does dosing need to be done via feeders? Do you need to prepare ingredients in some way before you put them into the mixer or another part of the process? 4. DON’T ignore the complexities of mixing and your specific needs when purchasing mixing equipment. What is the desired viscosity of your product throughout the mixing cycle? A thick batter will require different equipment than a thin sauce, for example. What type of mixing are you trying to accomplish? For instance, incorporating chocolate chips into cookie dough requires folding, whereas pancake batter would be shear mixed to break up clumps. Do you have ingredient add-backs? If you’re incorporating solids like blue cheese or relish, that will impact both the equipment you should use and the type of mixing you should do to maintain the integrity of the mixed-in ingredients. Will you need to reevaluate the order of additions? A thick mixture, when scaled up, can require much more powerful equipment to mix it at its thickest point, but reordering the additions may prevent the product from becoming as thick. Can one piece of equipment be used to scale-up multiple products? You will need to evaluate the products’ ingredients, viscosities and solids content to determine this. 5. DO factor in ingredient kill steps. Safety is a foremost concern for suppliers, consumers, and regulatory agencies. Products must not contain harmful microorganisms, and as such, a kill step—cooking, pasteurizing, or a pathogen-killing wash—is typically needed to ensure food is safe. Public safety and your company’s reputation is at stake. A hazard analysis of each step of your production will determine when and how the risk of microbial contamination can be minimized. What may seem like a minor step, such as not pre-treating an ingredient to kill a potential pathogen or bacteria, could be enough to trigger a recall and destroy your brand reputation. The devil is in the details, and it is critical to have the expertise to know how and when a kill step is needed. Do you have the necessary internal expertise, or should you seek outside support? Have you performed a risk analysis for each ingredient and production step? 6. DO consider the impact of larger product quantities on heating and cooling. What method of heating is best for your product (e.g., steam, hot water, pressure)? How will the times and temperatures of cooking and cooling be impacted? How will the heat treatment impact the flavor and color of the product? Will the heat treatment affect the shelf life? Will heating impact your raw material selection and order of additions? Once cooked, how fast can you cool a product without affecting the quality? Do you have the proper facility utilities to support heating and cooling changes? Pilot testing can help determine the most efficient process for these costly process and utility changes or upgrades. 7. DON’T rely on trial and error to optimize your process. Optimizing a new process can be very costly and time-consuming, but it doesn’t have to be. The challenges include dozens of parameters, changes in workflow, equipment decisions, facility layout, and scheduling both product and manpower. And the cost associated with experimentation isn’t cheap. Consider that you will need to pay for raw materials, manpower, possible rental of equipment, and use of space. This is an especially high price to pay when you’re also unlikely to fully optimize a process using experimentation alone. What ingredients will be used? What formula will be used? Which sizes of equipment will be needed? How much manpower will be needed? How can waste be minimized? How should waste be disposed? How can heating or cooling be done efficiently? How much counter space is needed? Simulation software is one solution. Full scale-up can be simulated with predictive modeling software. This is how larger companies optimize their processes, and it eases the transition to higher production. While smaller companies cannot afford to buy simulation software, consulting firms make it available. When most process questions are answered by the simulation, the time and costs needed for experimentation are significantly reduced and tragic mistakes are avoided. 8. DO consider production requirements and future needs when making equipment decisions. Will you grow capacity with larger or more equipment or by adding shifts? Will existing equipment support your new production needs? Will existing equipment support current customer configuration requirements? Will those requirements change within the year, seasonally or annually? 9. DON’T ignore the impacts of scale-up on personal safety. How will you move and lift very heavy buckets or barrels of materials? Use lifting aids, gloves, hard hats and other safety equipment to avoid muscular strain, pinching and cuts. How will you protect employees handling large quantities of chemicals, irritants or hot products? Personal protective equipment like eye protection, gloves and more may be necessary. Will you be weighing large quantities of spices and powders? These can create clouds of dust that are not only uncomfortable but also affect employees’ respiratory systems. You’ll need to have breathing masks, powder handling equipment or dust collection systems. Are you using industrial equipment that produces potentially harmful noise levels? Ear protection can prevent long-term hearing damage. 10. DO make compliance with food safety regulations a priority. Regulatory compliance is not optional, and your business needs to adjust to the rules and regulations at state, local, and federal levels. It’s important to understand if your business falls under Food and Drug Administration or United States Department of Agriculture jurisdiction and to understand which regulations apply to you. Is your facility built to standards, and is it able to handle more aggressive cleaning regimes? How will heating and cooling times and temperatures change for much larger batches of raw materials and products? How long can refrigerated products be left out before they become unsafe? How long does it take for a large batch of product to reach cooking temperature? How long does it take for a large batch to cool? Is your air-handling system designed to comply with environmental contamination requirements? 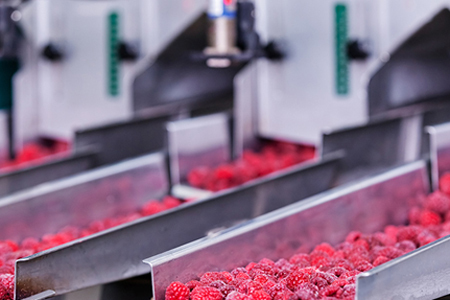 Air handling plays a very important role in keeping food safe by using air pressure and flow. How will your building’s air handling be impacted by scaling up? Cooking large batches of product will make the room hotter than cooking at a smaller scale, and air handling needs to be taken into account for this too. 11. DO reevaluate cleaning methods. Changes in formulation and equipment sizing impact cleaning. As equipment becomes larger, cleaning by hand becomes less efficient. Are the walls, floor and ceiling of your facility made of materials that won’t trap microorganisms? Are the floor drains easily cleanable and sanitary? Do you have the capabilities to wash all of your equipment? Does the equipment need to be taken apart for cleaning? How long does the cleaning operation take? Does an automated clean-in-place (CIP) system make sense? Simulation is important for understanding what size of CIP system is needed. If the system is undersized, you will lose hours of production. If the system is oversized, you will have wasted capital expenditure, and you will use more cleaning chemicals, hot water and utility costs than necessary. Are your existing cleaning chemicals still effective with the new process? Will you need to source chemicals from a new supplier? 12. DON’T overlook yield loss. Getting a thick product out of a large vessel as opposed to a pot will require new methods or mechanical aids. Evaluate the size and surface finish of your vessel to determine whether you will need to employ methods like scrape agitation, pressure or vacuum. Product left in the lines running to a filler can also reduce your yield. There are several methods to evacuate the lines, including air purge, water push, pigging and a fluid vacuum system. Consider how your waste product could become a new revenue stream. For example, the whey leftover from cheese production is a valuable product itself. Strategically line up your products for case packing to avoid loss. Certainly, the higher the value of your product and the more frequent your changeovers, the more important product recovery will be. Scale-up is an exciting time with much hope and promise, yet it is also a vulnerable time for young businesses. Innovators who do not plan ahead can make tragic mistakes and suffer losses too great to survive. The challenges of scale-up are not insurmountable. Plenty of entrepreneurs have succeeded, and you can too! A key to success is learning from others who have navigated the start-up path ahead of you. Ben serves as director of process technology at CRB. In this role, Ben provides clients with expertise and an in-depth understanding of process design and equipment. Prior to joining CRB, Ben spent 22 years with A&B Process Systems Corp. where he held several positions of increasing responsibility, including lead fabricator, plant team lead, lead manufacturing estimator, project manager and technical sales manager. Learn more about Ben here. Pablo serves as director of food processing at CRB. He holds a doctorate in food science and has 20 years of experience as a process engineer and food scientist. He makes it his mission to combine both roles in a seamless and structured way. His expertise includes process and product design and development, novel technologies and hygienic manufacturing. Pablo is recognized by the FDA as a food safety process authority and has been the recipient of six industry awards in recent years. Learn more about Pablo here.